We all know how much I love bread and all things bread related. It’s been a while since I’ve posted anything sourdough, and I had a hankering to experiment with a recipe I’ve never tried before using sourdough. I mean, my fall-back recipe using my sourdough starter are my Sourdough Soft Pretzels, except recently, I’ve been turning them into dinner by wrapping the dough around hot dogs and then proceeding with the recipe – BAM! Sourdough Pretzel Dogs.If you think that sounds good – seriously try it! It’s FANTASTIC! It’s also my new favourite way to eat hot dogs… and I was never a hot dog fan. Either way – I love bread, I love buns. I’m really and truly a carb fan. This recipe is simple, and the longest part is waiting for the buns to rise. Still, one more way to use my sourdough starter, and I’m fine with that! In the bowl of a mixer fitted with a dough hook, or by hand, combine all ingredients and knead until you get a soft, smooth dough. Transfer to a lightly oiled bowl and cover with plastic wrap or a tea towel and let rise until almost doubled, about 1½ – 2 hours. Gently deflate dough and transfer to a lightly greased work surface. Roll and pat the dough into a rough rectangle about 12″ x 16″. Brush some of the melted butter over the surface of the dough. Starting with the long side, roll the dough into a log. 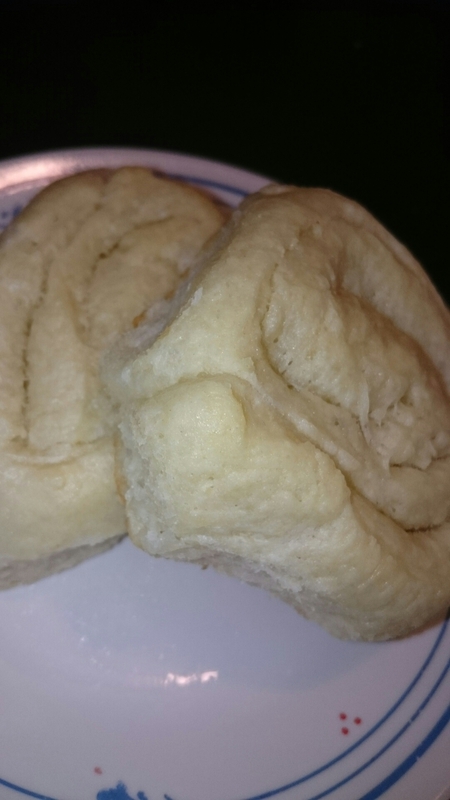 Cut 16 buns out of the dough log with a sharp knife or use dental floss. 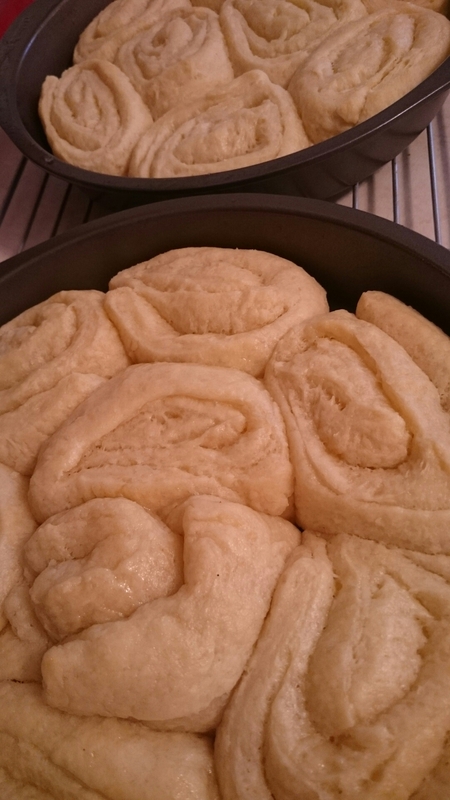 Lightly grease two 8 or 9 inch cake pans, and arrange 8 buns in each pan. Cover the pans with a tea towel, and let rise for about 1 hour, until they are noticeably puffy. Toward the end of the rising time, preheat the oven to 350° F.
Uncover the buns, brush with remaining melted butter, and bake for 22-25 minutes. They may only darken on the top very slightly. Remove from the oven, and turn out onto a wire cooling rack. Serve warm or hot with more butter as desired. 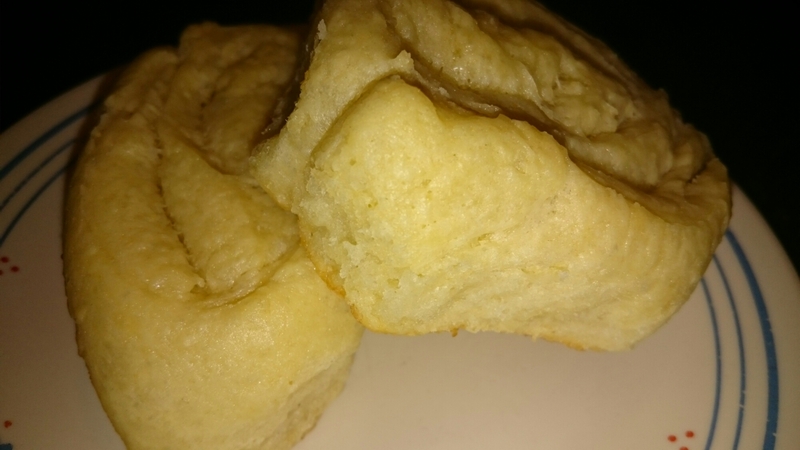 You can also save some of the melted butter to brush over the buns when they come out of the oven.